The Bare Hands Fighting is all an Art that the Ancients have been forged throughout the time and the space into a Martial Art. As an Art, obviously Martial Art requests a methodology, this is the one of the Codified Sequences of the Fist Art, i.e. the Methods of Training for Codified Sequences of Bare Hands Fighting. Therefore, after he have been well learning Codified Sequences of the Fist Art, Martial Student will need to learn the way to « Fight with Bare Hands » inherent in each category of Codified Sequence. It's about a specific point of Traditional Martial Arts truthly from Bình-Định, issue from the bygonedays Battlefield's Martial Arts. Totally different from the Arts of Self-Defence and Fighting Sports of nowadays. The Methodology of Training for these Codified Sequences includes Five fundamental Methods : 1.Those of Postures (Tấn-pháp) ; 2.Those of Movings (Bộ-pháp) ; 3.Those of Hands and Legs (Thủ-Cước-pháp) ; 4.Those of Body (Thân-pháp) ; 5.Those of Eyes (Nhãn-pháp). In addition, Martial Student who wants to evolve for reaching Martial Art's high sphere, will need to perfect in the sixteen Methose, those of Consciousness (Tâm-pháp) ; that means to perfect spiritually oneself by training for the concentration of Three Sacred Jewels Tinh-Khí-Thần (Seminal Essence Energy - Vital Breath Energy - Spiritual Energy). 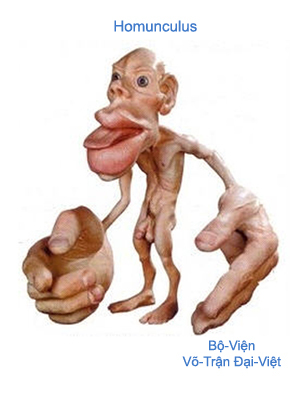 The essential part of Hands Method in Codified Sequences is currently demonstrated in concrete terms by modern Medecine throughout the Physiological Projection of Brain Cortex (Homunculus). 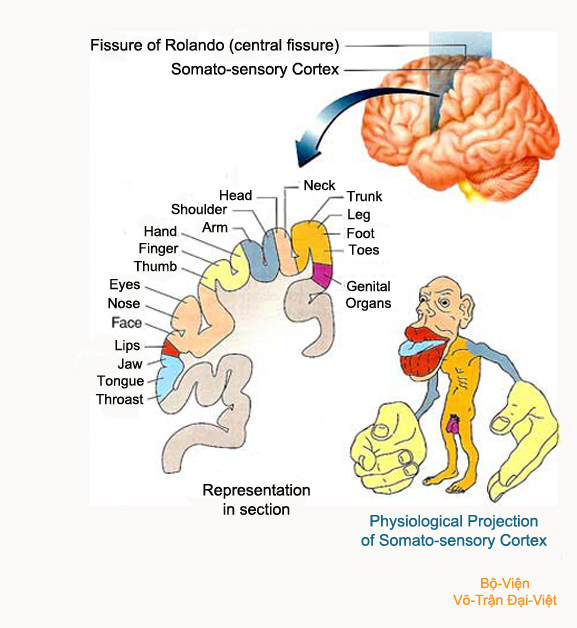 The Diagram representing the Physiological Projection of Somato-sensory Brain Cortex (Homunculus) shows us that our Hands ocupy maximum area of the Brain Cortex. And the Neurology eloquently demonstrates us the essential part of Codified Sequences as well as their deep and enduring influence on human being. -	a person training for chinese Codified Sequences, can not perform correctly the Codified Sequences from Đại-Việt Medieval Battlefield Martial Arts. Except if this person made a firm resolution to pursue the training according to only one Methodology of Codified Sequences. Of course, here we talk only about the sincere person having a passion for the Culture of Traditional Martial Arts. The way to perform a Codified Sequence is infinitely important. It's it who determines the specific nature to a School System. And this is the reason for that the necessity of conservation and restoration of Codified Sequences handed down by the Ancients to the posterity is an imperative thing (we don't talk about Codified Sequences having been falsified and counterfeit during these last times). The Traditional Martial Arts of Bình-Định requires a true transmission ; if we leave them to mix with other imported Martial Arts, then the foundationts of Traditional Martial Arts of Bình-Định will be most probably and certainly lost. 5. The « Võ Thiếu-Lâm-Tự », Martial Arts from Shao-Lin Temple, imported under SONG Dynasty (960 ~ 1279) and MING Dynasty (1368 ~ 1644). The Ancients called them briefly by : Lâm - Kinh -Truyền - Phật-Gia Quyền - Thiếu-Lâm-Tự. They were Five Fingers of the Hand keeping the Jewel which is the Martial Art from Việt people. It's precisely thanks to five able-bodied fingers that the hand can have effective gestures. If we have gone to sew this Five Fingers to assemble them, then of course our Hand would loose surely his dynamic function and this disabled Hand would leave linexorably fall out the Jewel of Martial Arts Studies from our Việt Ancestors. The preservation or the wastage of the Cultural Heritage of the Nation's Martial Arts Studies - that our Precursors had braved so of efforts and difficulties in order to bequeath to the posterity - depend on the survival and independance of these Five Great Schools Systems. Battlefields Martial Arts of Đại-Việt include two branches of Bare Hands Fighting's Codified Sequences, called «Cương-Quyền» (Hard Fist Style) and «Nhu-Quyền» (Soft Fist Style) capitalizing the marvelous Principle of Bipolarity Ảm-Dương (Yin & Yang) in the universe.